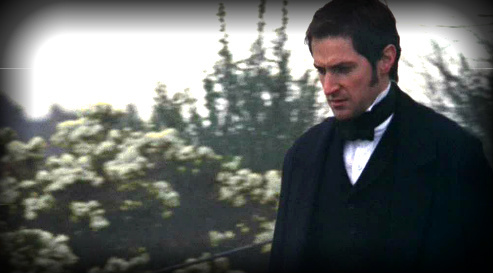 in North and South, I really, realllly didn't like him. minister's daughter, Margaret Hale, looked on in amazement... shocked, horrified and appalled. because it was, after all, a period drama, and I love period dramas. there I was madly in love with John Thornton! Yes, that very same John Thornton who had beaten up that scrawny Lilliputian worker. when Margaret Hale was obviously the much more admirable character? What was the matter with me? 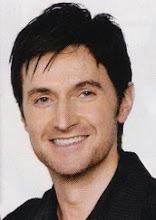 Richard Armitage, (mainly because he was Richard Armitage). it was all to save his poor mill hand Eds and Ellas from being burnt to cinders by a weak and selfish lout. 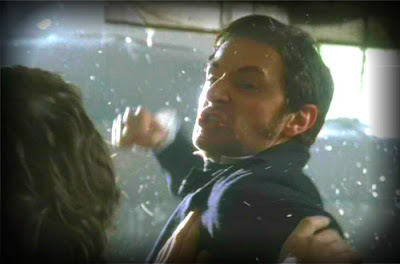 John Thornton, for humiliating him so, for making him feel unworthy of her and her love. whom any sane woman would die for? What was the matter with her? felicitous, accidental encounter on a railway platform. can't get enough of it. Maybe I'll be re-watching it over and over ... and over ... for the rest of my life. Have you seen that railway scene? 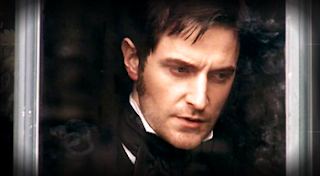 a crush on John Thornton, aka Richard Armitage? Can you still ask what is the matter with me? If so, what is the matter with YOU?! Artist and writer Mary Grace Dembeck isn't sure which she loves to do most ... paint or write. Born in New York City, she has lived in Westport, CT, for the past 45 years. 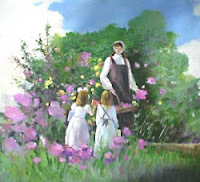 She has exhibited paintings at The National Academy of Design, and her writing has been published in The Wall Street Journal, Reader's Digest, Ranger Rick, and various other US journals and magazines. Mary also collaborated on a number of songs with singer Maureen McGovern, and on a children's musical, The Bengal Tiger's Ball , based on one of Mary's poems, and it was performed in a month long run by Ms. McGovern at The Civic Theatres near Orlando, Florida. The musical was based mainly on Mary's lyrics. Her short story "Act of Memory" is included in the Paul Auster/NPR anthology "I Thought My Father Was God" (in Britain, the book is entitled: "True Stories of American Life".) It has been made into a short film by British actor/director Jack Ryder (formerly of Eastenders). The film has been entered in the Cannes Film Festival, as well as other festivals, and makes its World Premiere in America on March 24, 2012 at the Garden State Film Festival in New Jersey. The film has now also been accepted at the Newport Beach Film Festival in California. Jack Ryder's goal is to have the film shown on the BBC this coming Christmas Eve. Nat's Notes: Mary Grace is one of my newest RA buddies! I've enjoyed getting to know her. 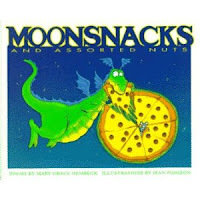 When I asked her to be a guest blogger, I had no idea Mary Grace was a published author! In fact, it wasn't until she sent me her "about me" information that I learned of her accomplishments. Thanks Nat and thanks to you, Mary for this little piece about falling for John thornton. 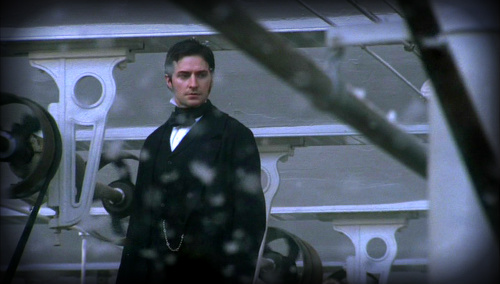 I have a confession - I actually saw the railway station scene on a YouTube vidoe before I saw N&S. It was a bit of a cheat, but it helped get me through the beating scene. I think I fell for him at the beginning of part 2 when he walks up behind Margaret while she is talking to the two spinners. Just read my typos above .... sorry!! It's the keyboard's fault! I'm here asking: What's the matter with us??? Lovely post. Thank you both por it!!! I hope to hear more about your work, Mary3! Nat: just rewatched your RA St. Patty's vid and laughed. You're in good company-we all love JT. And enthralled is a very good word for it. Ha! Ahhh, I loved your post! I was so shocked by the beating scene so early in the adaptation that I have never gotten over it. Every time I see it I can't help but call out "My John would never do that!" And we wouldn't be pig-headed as Margaret I am sure. Who could resist his allure? BTW it is a pleasure to meet such an accomplished lover of the arts. 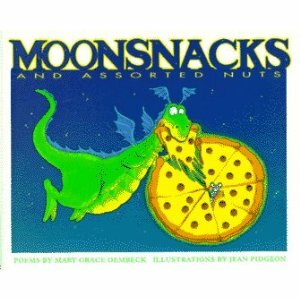 Must find your children's book to add to my 'sit on my lap' library. Mary is one heck of a witty lady, we've become friends through C19 and she is a kindred spirit who never ceases to amaze. A charming and funny contribution M3!! Richard Armitage is the most divine, long drink of cool, cool water in existence. The longing he is able to express with those intense brooding eyes gives me chills. Simply put, I am in love. I fell for him from first sight. As far as the beating he doled out; the worker WAS SMOKING in a cotton mill! He deserved if. I , for one, ADORE a man who is confident & upright enough to know when a situation calls for violence. As a parent, responsible for the welfare of your child, would you not reserve your brimstone for dire circumstances such as life threatening wrong decisions. He was quite right. 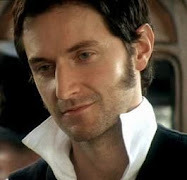 I say well done Mr. Thornton... oh and leave the cravat on. He plays a lot of characters named John, doesn't he? Loved John Thornton, my fave so far. He always brings a lot of depth to his roles, which I really find interesting. I had a very similar experience with N&S and I hate to tell you how many times I've watched it. 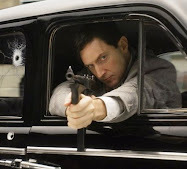 Sometimes I watch it all but most of the time I skip to all the scenes with RA and especially the train scene. Watched it last night in fact.